THE BEST BREAD SCORING LAME YOU’LL NEED TO BUY!!! You want a bread scoring lame use for make bread You have a strong desire to improve your lifestyle! Would you agree you need one of our bread scoring lame? could you see the benefits of a bread scoring lame? Are you serious about changing your habits? Do you think now is the right moment to make a change? ✔️ PREMIUM DOUGH SCORING TOOL: Be completely manipulated handicraft with wooden handle design and stainless steel bar, equipped with sharp razor blades "never get dull", Dibread scoring lame will help you become a baking artist with great experience, allow you to cut accurately & clearly on each cake. ✔️ EASY TO USE AND CLEAN: Perfect design brings convenience, helps you hold and cut comfortably. Besides the detail instruction is attached for safely using. When you finish, you can easily keep it hygenic and secure. ✔️ KEEP IN GOOD CONDITION: We are researching continuosly and improving on quality of product to serve our consumers in the best way. This product is well preserved with a protective holster and cotton dough scoring set. 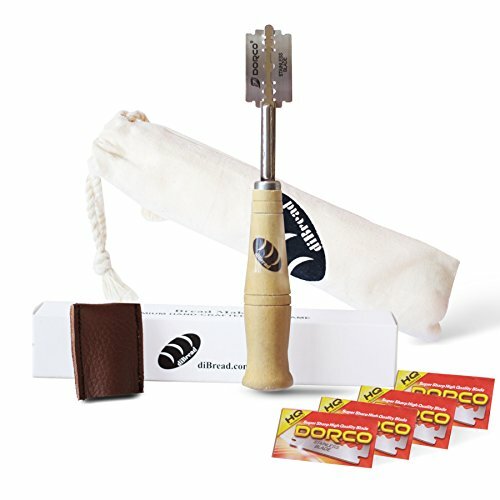 ✔️ BEST DOUGH SCORING SET: include 1x Wood Bread Lame, 5x Blade to supersede, 1x Authentic Protective Leather Cover, 1x Cotton Bag to safely store away after using, 1x Instructions for use and High-grade Box Contains the entire product. At a low price, you can own all of our products which is actually such a great gift for CAKE ARTISANS. ✔️ SATISFACTION GUARANTEED: We always bring great convenience & experience to customers in the US & around the world. So, choosing Dibread scoring lame to use is the best option for you! We affirm for 100% REFUND if you do not achieve 100% EXPECTED SATISFACTION. Try it out at no risk. Click 'Add to Cart' and 'Buy Now' ! If you have any questions about this product by DiBread, contact us by completing and submitting the form below. If you are looking for a specif part number, please include it with your message.